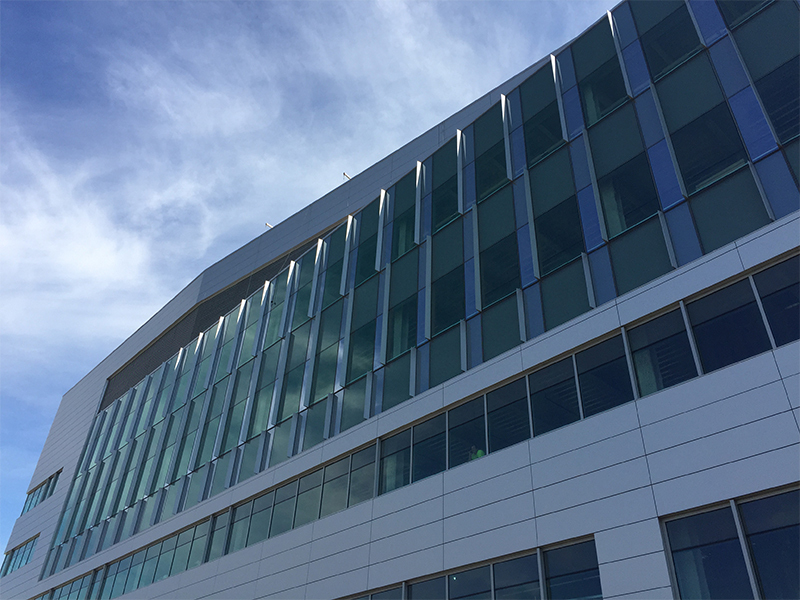 In fall of 2015, Lemberg partnered with Froedtert & the Medical College of Wisconsin and Mortenson Construction to brand the newly constructed Center for Advanced Care located on Froedtert's Wauwatosa campus. Lemberg's award-winning Sign Division, managed the manufacturing and installation of the sign, one of 12 new branding and 20 wayfinding signs created or updated by Lemberg for the campus. Lemberg is equipped to install signs in hard-to-reach places. With certified installers trained to work at dizzying heights, Lemberg makes the process look easy. 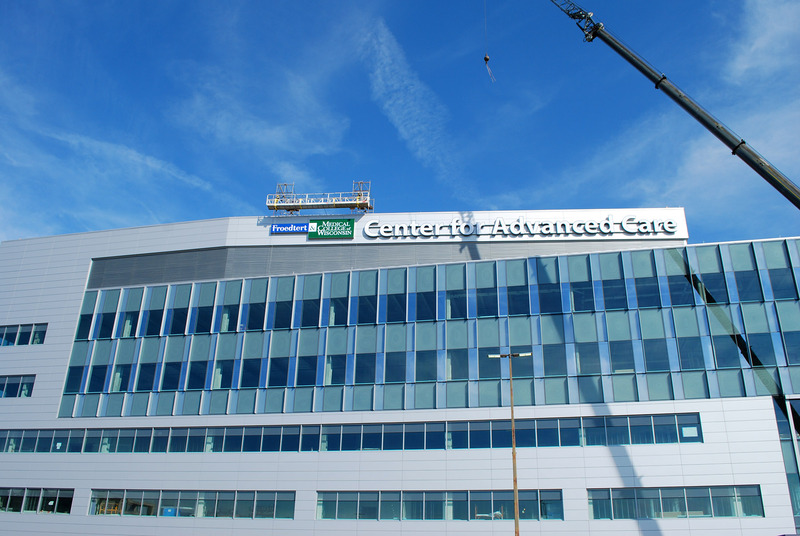 The signs for The Center for Advanced Care were installed at an impressive 160 feet off the ground. To get the job done, Lemberg's sign installation crew used a 200-foot, 95-ton crane, a scissor lift and a swing stage. 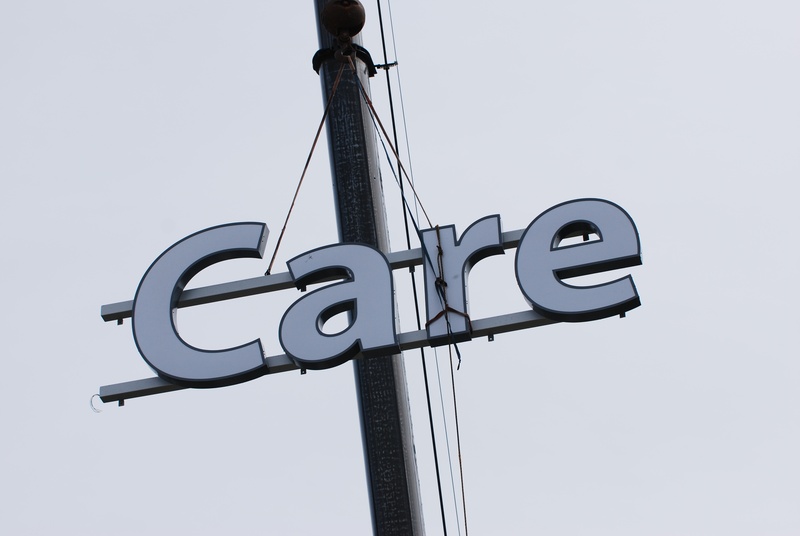 The crew used a scissor lift from the lower tier of the rooftop to install the lettering. 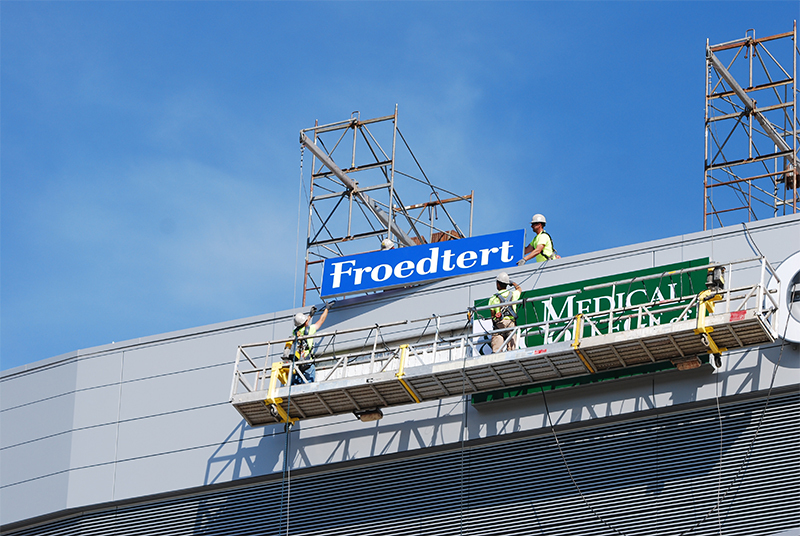 Because the location for the Froedtert & the Medical College of Wisconsin logo boxes was inaccessible from that point, the crew used a swing stage to cantilever over the edge of the building for the installation. 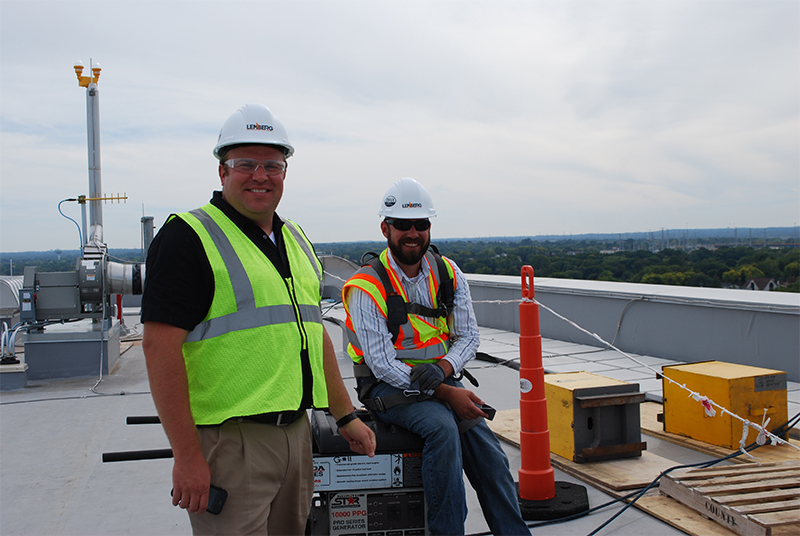 The crane operator and installers at ground level communicate with the installers on the swing stage using radios. The ground and lift teams work together to orchestrate the process of securing components to the boom and lifting them to the installation point. Since safe crane operations are dependent upon calm winds, wind speeds were closely monitored. With the help of several team members assisting with lifting, placement and connection from the roof and on the ground, all components were successfully installed. The installation process took about a day and a half. Just as Washington, D.C.'s large-scale historic monuments, are dwarfed by the length of the National Mall, the scale of the sign is thrown off by the size of the building. 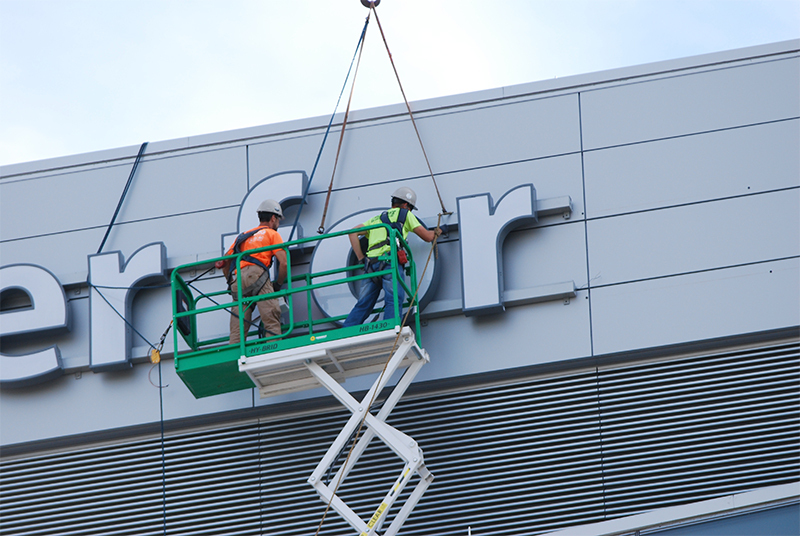 "The logo and letter sets are about 4-6 feet tall and the whole sign when completed is 115 feet long," said Brian Pritzkow, one of Lemberg's project managers for this installation. 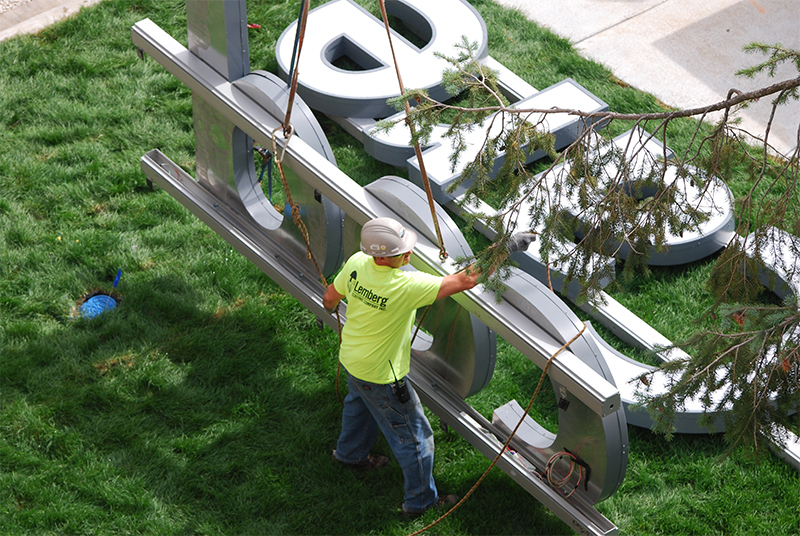 At ground level, the logos and letters are as tall as the installers. Find out more about Lemberg's Sign Division.